Our commitment to quality has allowed us to expand our services into an ever-widening area. MES is a drug free work place. All of our employees complete safety training including OSHA, Aerial Lifts, Personal Protection Equipment, Lock Out/Tag Out, and more. While MES is on site performing lighting maintenance and/or retro-fits, we can also complete any other electrical services needed. Our contracting services extend into two national regions. 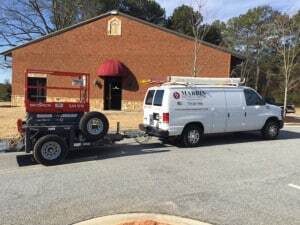 Marbin Electrical Services has a proven track record in electrical contracting. Since we are currently licensed in the southeast and mid-atlantic regions, we can provide the same level of top of the line service to a large number of locations. See the map for detailed states. 35 years experience in electrical and construction. 30 years in electrical, construction, lighting retro-fits and rollouts. 10 years electrical, project management and estimating.